Original tape date: June 10, 2013. First aired: June 10, 2013. Asian American Life is a new monthly series featuring the Asian American community in the tri-state. The first show is an overview of the tri-state's Asian Americans. It will feature a roundtable discussion with several prominent members of the community: Sayu Bhojwani, New American Leaders Project; Larry Lee, Asian Women's Center, Vanessa Leung, Coalition for Asian American Children and Families and Kyung Yoon, Korean American Community Foundation. We profile the oldest Asian immigrant enclave in the country, Manhattan's Chinatown, which will include a visit to the Museum of Chinese in America. We also introduce viewers to photographer Corky Lee, whose photographs have captured the Asian immigrant experience for more than four decades and world renowned physicist Michio Kaku. Host, Ernabel Demillo also learns how to make the perfect dim sum dumpling. 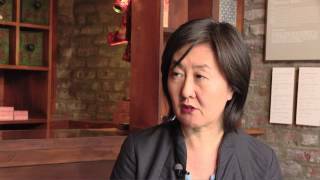 Helen Koh, Executive Director of the Museum of Chinese in America, talks about Chinatown. Asian American Life is an in-depth news magazine program that addresses topical issues affecting the Asian American communities nationwide and profiles Asian American leaders.